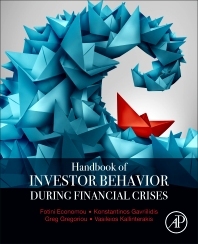 The Handbook of Investors' Behavior during Financial Crises provides fundamental information about investor behavior during turbulent periods, such the 2000 dot com crash and the 2008 global financial crisis. Contributors share the same behavioral finance tools and techniques while analyzing behaviors across a variety of market structures and asset classes. The volume provides novel insights about the influence and effects of regional differences in market design. Its distinctive approach to studies of financial crises is of key importance in our contemporary financial landscape, even more so since the accelerated process of globalization has rendered the outbreak of financial crises internationally more commonplace compared to previous decades. 19. Exchange-Traded Funds: Do They Promote or Depress Noise Trading? Fotini Economou received her Ph.D. from the University of Piraeus. She has published in journals such as the "Journal of International Financial Markets, Institutions and Money" and the "International Review of Financial Analysis," among others.